Culms: Erect, slender to stout, hollow, glabrous, green or blue-green waxy. Blades: Flat or rolled inward, 4-16 inches long, .25 to .5 inch wide, slightly narrowed toward bases, midrib prominent beneath, rough or bristly-hairy above; margins fine-toothed; tips tapered to fine points. Sheaths: Mostly longer than internodes, rounded, usually glabrous; auricles prominent, finger-like, clasping. Ligules: Short, membranous, entire or notched. Inflorescences: Spikes, dense, erect or nodding, 3-12 inches long, occasionally interrupted below, terminal. Spikelets: 1-4 per node, overlapping, slightly spreading, sessile, 2-7-flowered; glumes equal, shorter than first lemma; lemma awns .5 to 1.5 inch long, outward curving at maturity. Habitat: Moist or dry open prairies, stream banks, ditches, and disturbed areas, more abundant on sandy or rocky soils. Toxicity: Ergot can infest the inflorescence and is potentially dangerous to livestock. Forage Value: Canada wild rye is very palatable and nutritious and is readily grazed by livestock. The forage value decreases with age. Comments: Tufted. 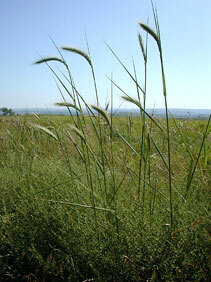 Sometimes called "nodding wild rye" because of the arching heads. It is winter hardy and grows as far north as southern Alaska.